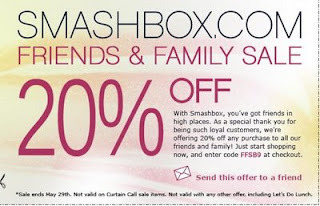 Smashbox Friends and Family Sale. Will you be getting anything? If so what? I might pick up my tried and true photofinish primer. I actually just picked up the light foundation primer at Ulta the other day....when you spent 25.00 you got a free eyeshadow. They were out of the free product but gave me something in place....Fusion Soft Lights in Dusk. I really seem to be liking this little gift. Krista- That is such a nice gift! Good job! Enjoy. No problem! Glad you enjoyed! !